I was pretty curious about the new course for this race. I am not one of those people who looks into the details of a course before running it. Why worry about a hill at mile 3 days in advance, right? Probably not smart of me, but that's just my tendency. Anyway, I had heard that the new course had some views of the ocean, but the main reason I did this half-marathon was because Tea Time was running the marathon. Glad I was there to see it! The race started at a very early 6:30 AM under an overcast sky at Fashion Island in Newport Beach. This held up the whole time I was running and beyond -- perfect running weather, in my opinion. I waited in the first corral behind a 1:50 (half) and 3:40 (full) pace group, but I could not keep up with them for even the first mile! This is weird, since "The Ukrainian," who has always run under 1:50, was running with me for the first mile and a half, and we were doing 8-min mile pace. He eventually passed that pace group, but they just started off unusually fast. Anyway, without people to pace me, I ran by feel. I was trying to keep my pace between 8:50 and 9:00 per mile, since I rarely train faster than that. The first few miles were a bit up-and-down, though nothing that would disqualify the course from being called "flat." There were also some nice downhills and ocean views, as well as a nice breeze. I was running some good splits for the 5k (~26 min), 10k (~53 min), and 7-miles (just under an hour). After that point, I started to run out of gas. I normally don't get drained so suddenly, but I felt like passing out at some points. I started stopping at more water stations and had to walk a few times. I was undertrained, and I was feeling it. The majority of the rest of the race was on bike trails, which was quite boring and more up-and-down. My stomach started to hurt. 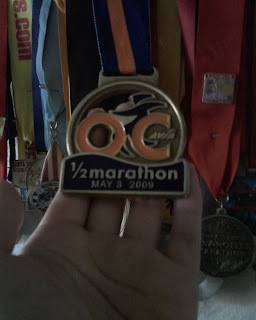 As a note, I get stomachaches during races maybe 3/4 times, but this was one of the most painful. It reminded me (slightly) of the horrible one I had during a botched 20-miler I tried recently during which I lost five pounds in the restroom. (sorry for TMI). All that aside, I was tired and succumbed to some Powerade at one of the last water stations. I haven't had any sports drink in AGES, but it tasted good at the time. The only thing that kept me going was telling myself that I could have more when I finished (there was no Powerade at the finish, unfortunately). As I was within the last half a mile from the end, I thought I might be able to beat my PR (1:57:05), but even as my watch said 13.1, I still had to run another .1 of a mile! So I ended up with the time you see above, which is not bad for me. Of my 12 halfs done so far, this is only the third time I've done sub-2. I was happy about the food they had at the finish -- cut-up bagel pieces, oranges, bananas, vegan protein bar halves, energy drinks, Promax bars, and chocolate soy milk!!! The bagel really helped my stomach. On a side note, a man spotted me wearing my Surf City shirt from last year and said, "You've been caught wearing a Surf City shirt!" and handed me a longboard keychain! My lack of training was probably to blame for not PR-ing on this relatively flat course, but I still did better than times when I did train. I am a bit embarrassed that I have to keep admitting to a lack of training, but life has been crazy, and I've been tired!! Perhaps my body is getting accustomed to the abuse. I hope this means I will improve in the future if/when I actually do decide to specifically train for a race again. Finally, I am SO proud of Tea Time for running the full marathon in 4:01, which is awesome!! That speed demon was running faster than me at 13.1 miles even though she had more to go. She's worked really hard and deserves that 39-minute PR. I'm sure she'll be BQ-ing before long... Also, congrats to some of her running teammates for running their first marathons. They were SO excited about it the night before when we all had dinner together... I remember when I used to be like that.